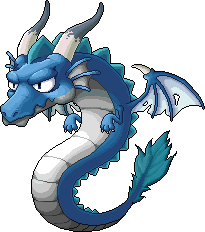 Master of the Dragon Canyon, the Leviathan is the loyal servant of the Horntail. Born from a glowing silver egg, it has grown to become the protector and ruler of the Wyverns in the Canyon. Leviathan attacks travellers that approach the Cave of Life while silently hovering over the canyon skies, flying around with its silky smooth snake-like skin and wings. It is a much-feared creature in the canyon.